As your Puppet Enterprise infrastructure scales up to 4,000 nodes and beyond, add load-balanced compile masters to your monolithic installation to increase the number of agents you can manage. Each compile master increases capacity by 1,500 to 3,000 nodes, until you exhaust the capacity of PuppetDB or the console. A single master can process requests and compile code for up to 4,000 nodes. When you exceed this scale, expand your infrastructure by adding compile masters to share the workload and compile catalogs faster. Compile masters act as PCP brokers, conveying messages between the orchestrator and Puppet Execution Protocol (PXP) agents. PXP agents connect to PCP brokers running on compile masters over port 8142. Status checks on compile masters must be sent to port 8140, using https://<hostname>:8140/status/v1/simple. When triggered by a web endpoint, file sync takes changes from the working directory on the MoM and deploys the code to a live code directory. File sync then deploys that code to all your compile masters, ensuring that all masters in a multi-master configuration remain in sync. By default, compile masters check for code updates every five seconds. The certificate authority (CA) service is disabled on compile masters. A proxy service running on the compile master Puppet Server directs CA requests to the MoM, which hosts the CA in default installations. Logs for compile masters are located at /var/log/puppetlabs/puppetserver/. Logs for PCP brokers on compile masters are located at /var/log/puppetlabs/puppetserver/pcp-broker.log. When using more than one compile master, a load balancer can help distribute the load between the compile masters and provide a level of redundancy. Specifics on how to configure a load balancer infrastructure falls outside the scope of this document, but examples of how to leverage haproxy for this purpose can be found in the HAproxy module documentation. PCP brokers run on compile masters and connect to PXP agents over port 8142. PCP brokers are built on websockets and require many persistent connections. If you're not using HTTP health checks, we recommend using a round robin or random load balancing algorithm for PXP agent connections to PCP brokers, because PCP brokers don't operate independent of the orchestrator and isolate themselves if they become disconnected. You can check connections with the /status/v1/simple endpoint for an error state. You must also configure your load balancer to avoid closing long-lived connections that have little traffic. In the HAproxy module, you can set the timeout tunnel to 15m since PCP brokers disconnect inactive connections after 15 minutes. The Puppet REST API exposes a status endpoint that can be leveraged from a load balancer health check to ensure that unhealthy hosts do not receive agent requests from the load balancer. The master service responds to unauthenticated HTTP GET requests issued to https://<hostname>:8140/status/v1/simple. The API responds with an HTTP 200 status code if the service is healthy. If your load balancer doesn't support HTTP health checks, a simpler alternative is to check that the host is listening for TCP connections on port 8140. This ensures that requests aren't forwarded to an unreachable instance of the master, but it does not guarantee that a host is pulled out of rotation if it's deemed unhealthy, or if the service listening on port 8140 is not a service related to Puppet. Due to the diverse nature of the network communications between the agent and the master, we recommend that you implement a load balancing algorithm that distributes traffic between compile masters based on the number of open connections. Load balancers often refer to this strategy as "balancing by least connections." To install a compile master, you first install an agent and then classify that agent as a compile master. Note: Set the dns_alt_names value to a comma-separated list of any alternative names that agents use to connect to compile masters. The installation uses puppet by default. Pin the compile master node to the PE Master node group. Enter the Certname for the compile master, click Pin node, and then commit changes. After installing compile masters, you must configure them to appropriately route communication between your master of masters and agent nodes. Compile masters must be configured to appropriately route communication between your master of masters and agent nodes. Install compile masters and load balancers. If you need DNS altnames for your load balancers, add them to the master. Configure pe_repo::compile_master_pool_address to send agent install requests to the load balancer. Important: If you have load balancers in multiple data centers, you must configure compile_master_pool_address using Hiera, instead of using configuration data in the console, as described in this step. Using either of these methods updates the agent install script URL displayed in the console. Click Add data and commit changes. Run Puppet on the compile master, and then on the master of masters. Configure infrastructure agents to connect orchestration agents to the master of masters. In the console, click Classification, and in the PE Infrastructure group, select the PE Infrastructure Agent group. If you manage your load balancers with agents, on the Rules tab, pin load balancers to the group. pcp_broker_list JSON list including the hostname for your master of masters. If you have an HA replica, include it after the MoM. Hostnames must include port 8142, for example ["MASTER.EXAMPLE.COM:8142"]. master_uris Provide the host name for your master of masters, for example, ["https://MOM.EXAMPLE.COM"]. Uris must begin with https://. This setting assumes port 8140 unless you specify otherwise with host:port. Remove any values set for pcp_broker_ws_uris. Run Puppet on all agents classified into the PE Infrastructure Agent group. This Puppet run doesn't change PXP agent configuration. If you have high availability configured and haven’t already pinned your load balancer to the PE Infrastructure Agent group, the Puppet run configures your load balancer to compile catalogs on the MoM. 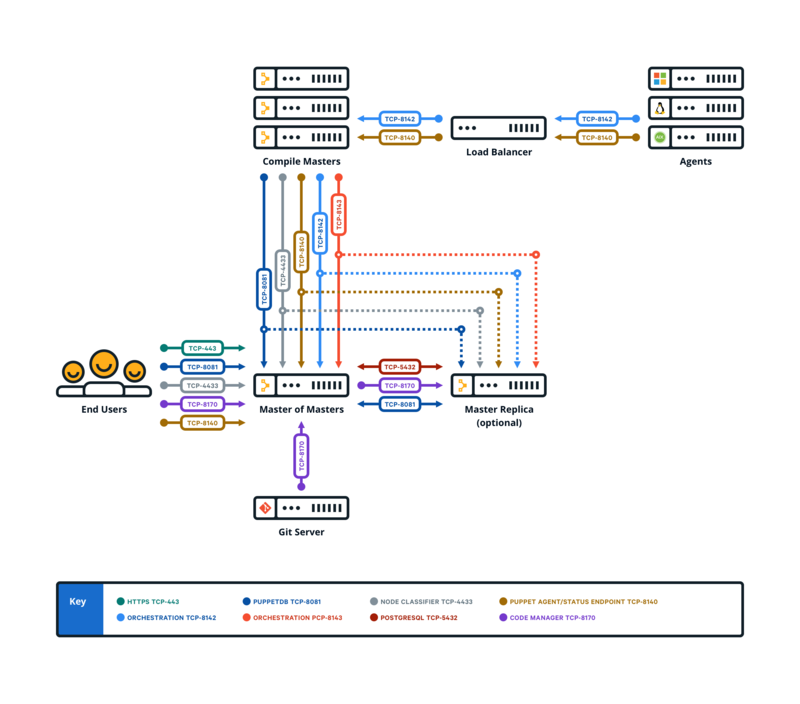 Configure agents to connect orchestration agents to the load balancer. master_uris Provide a list of load balancer host names, for example, ["https://LOADBALANCER1.EXAMPLE.COM","https://LOADBALANCER2.EXAMPLE.COM"]. Uris must begin with https://. This setting assumes port 8140 unless you specify otherwise with host:port. Run Puppet on the master, then run Puppet on all agents, or install new agents. This Puppet run configures PXP agents to connect to the load balancer.